It’s undeniable that knowing what’s in your water is, at the very least, prudent. At SimpleWater, we think it’s crucial. What you put in your body impacts both your short-term and long-term health. Our goal is to enable people to both discover and understand what is in their drinking water. Our Tap Score home water testing kits are one means of spreading that goal, but there are lot of other resources out there that that can shed some light about what flows from your tap. If you are wondering why your tap water, smells, looks, or even tastes funny–a Consumer Confidence Report (CCR) is one way to start finding answers. You will only receive a CCR if you are on a community water system. People who receive their water from a private well do not receive CCRs, as private wells are not regulated by the EPA. However, if you are on a private groundwater well and would like more information–we recommend taking a look at the Center For Disease Control’s Private Ground Water Wells page. How Can I Receive My Consumer Confidence Report? The way you are able to access your CCR depends on your living situation. If you live in a home: You will most likely automatically receive a copy of your CCR from your local water utility via mail each year. What Does a Consumer Confidence Report Tell You? All data on your CCR will be tailored to your local water utility. What Does All of This Mean?! 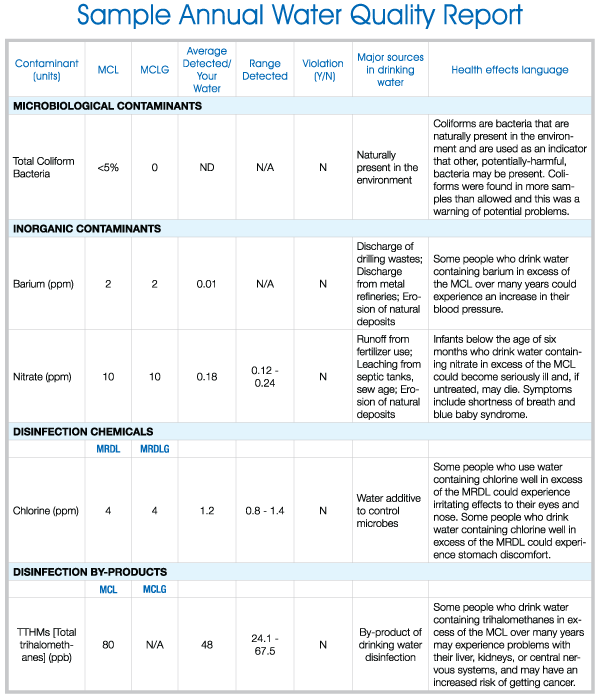 Column 7: A short overview of health effects related to the contaminant. What To Do If You Are Concerned About Your Consumer Confidence Report? Unfortunately, Consumer Confidence Reports do not always report 100% clean water results.. Frequently, chemicals and contaminants may be present in your water, and it might have you feeling confused or concerned. Rightfully so! Our Tap Score home-testing kit is another great resource if your questions were not addressed on your CCR. We test for over 400 contaminants, will provide you with cutting edge water health analysis, unbiased treatment recommendations. If you have any questions, feel free to contact us at hello@simplewater.us and we’d be happy to help! The EPA’s CCR Frequent Questions page. This is a good resource if you have general questions. The EPA’s Safe Drinking Water Hotline at 1-800-426-4791 can also provide answers. Older PostBuying A Water Test Online?